Product prices and availability are accurate as of 2019-04-21 19:06:53 UTC and are subject to change. Any price and availability information displayed on http://www.amazon.com/ at the time of purchase will apply to the purchase of this product. When her granddaughter was accepted to Naropa University, the celebrated author Pema Chödrön promised that she’d speak at the commencement ceremony. Fail, Fail Again, Fail Better contains the wisdom shared on that day. “What do we do when life doesn’t go the way we hoped?” begins Pema “We say, ‘I’m a failure.” But what if failing wasn’t just “okay,” but the most direct way to becoming a more complete, loving, and fulfilled human being? Through the insights of her own teachers and life journey, Pema Chödrön offers us her heartfelt advice on how to face the unknown—in ourselves and in the world—and how our missteps can open our eyes to see new possibilities and purpose. 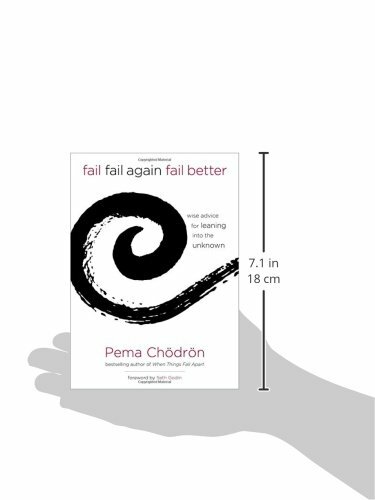 For Pema’s millions of readers, prospective graduates, or anyone at a life crossroads, this gem of clarity and reassurance is sure to find a welcome place in many a kitchen, office, and backpack.